Challenging the Bonsai A to Z entry for Azalea (Rhododendron). Azaleas and rhododendrons are the same plant, both ericaceous (lime-hating), with thousands of cultivars. They are noted for the wide variety and vibrancy of colours of flowers which bloom mostly on "garden" specimens in mid-spring. 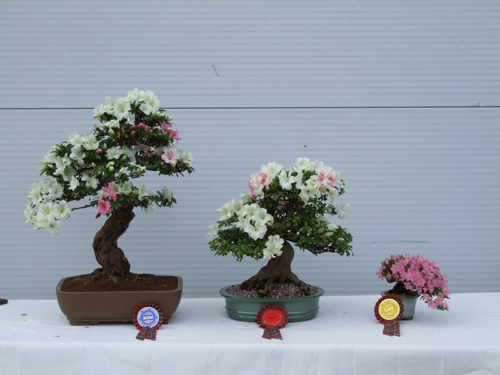 Most popular for bonsai are the Satsuki Azalea (Rhododendron Indicum) which are distinguished by often having multiple different coloured blooms on the same tree. Also popular although less well recognised is the Kurume Azalea which is a hybrid of R. obtusum and R. kiusianum both native to the island of Kyushu, the southernmost island of Japan. STYLE : Best in all sizes and all styles, except broom. WARNING : Some fertilizers can be slightly alkaline so ensure truly ericaceous fertilizer only is used. The "bonsai4me" website (see attached link) provides a comprehensive species guide for this species. The Satsuki Database from the Netherlands provides a comprehensive guide to types of Satsuki Azaleas. LOCATION : Prefers semi-shaded but warm position. Susceptable to frost damage so best moved to sheltered (not indoor) position in winter. REPOT : After flowering. Annually when young or as roots fill the pot when they get older. SOIL : Acid (lime free) free draining soil : 30:70 grit:organic. Ph. 5.0-6.0. PRUNE : Branches in autumn. PINCH : Cut flower stems after flower starts to wither. Lightly prune secondary shoots until mid summer. WATER : Water well in growing season, sparingly in winter. Do not let soil dry out. FEED : Two weekly ericaceous feed during growing season, low nitrogen in autumn. The "bonsai4me" website (see attached link) provides a comprehensive species guide. There are 819 entries in the A to Z and the pages have been viewed 3064668 times. Help us to increase the number of relevant bonsai terms included in this A to Z of Bonsai Terms. We include manufacturers and dealers in the dictionary, if you are one or know of one not mentioned then just click the link above and add an entry. If you have a favourite bonsai tree not mentioned just add an entry. We are trying to create a unique single free source for all bonsai terms and hope to capture worldwide bonsai terms for bonsai trees, bonsai clubs associations and national collections and the A to Z is free marketing for bonsai businesses and bonsai clubs.